We will be talking about Plagiarism and Copyright. 8 things to know about Plagiarism and Copyright. Plagiarism and Copyright is frowned upon. 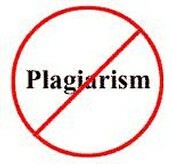 Plagiarism is take information for an author and not giving credit. Copyright is when you take someones creation and not give credit to the creator. The fair use act talks about when copyright is ok. Copyright dose not last forever. At the Performing Arts Center in the Fowlerville High School. Plagiarism Crossed out. Digital image. Http://www.shortsaleartisan.com/. WordPress, n.d. Web. 24 Sept. 2014.